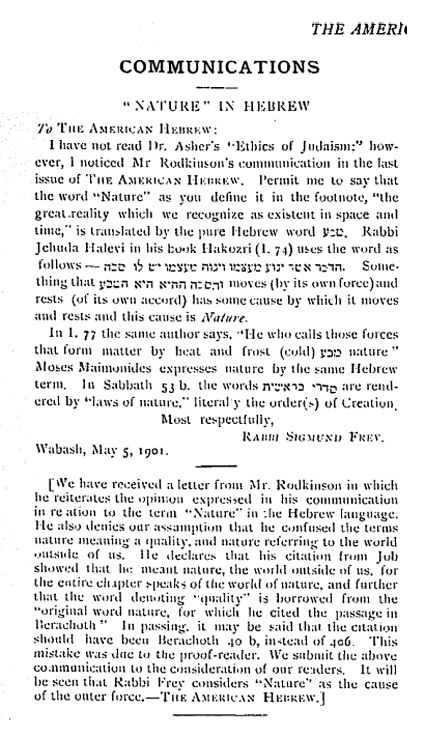 Here is an instructive pair of letters to the American Hebrew which, I believe, give an idea about Michael Levi Rodkinson's English limitations. What had happened was a rabbi named J. Mayer Asher had lectured before a group called the Council of Jewish Women, on a topic he called The Ethics of Judaism. The lecture appears to have been a typical contrasting of Greek and Hebrew morals. Asher asserted that ethics are Greek, morals are Jewish, and the distinction is blah blah. He raised a Kantian idea regarding the relation of the moral to the physical; the inner and the outer world, i.e., nature, which is ruled by causality. A certain book had tried to understand how the fixed world outside of us can be changed to conform to moral law. But this, said Asher, was an idea that is alien to Judaism. Besides, he said, there is "no pure Hebrew word that means Nature. Nature is a purely Hellenic concept," reported the American Hebrew. The Jewish idea is that God rules the outer as well as the inner world, Nature is ruled by Him. On this, Rodkinson pounced. Of course there is a Hebrew word for nature - teva. Now, Rodkinson probably realized that this was a medieval coinage, but he could point to its precursors, the tet-bet-ayin root, that mean "nature." The trouble is, in each instance Rodkinson explained the term "nature" in the sense of "the character of something" rather than "the collective phenomena of the physical world," which is plainly how Asher intended it. It is quite instructive to read how, in each instance, Rodkinson imaginatively explains Hebrew words derived from the root tet-bet-ayin to conform to the meaning "the character of something." For example, he explains the word matbea, coin, to have come from the meaning "the nature of this coin is, that it contains so and so many lesser coins." And so on. It is perhaps true, of course, that the same relationship between nature in its various meanings of "the characteristic of" and its eventual secondary meaning as "the collective physical phenomena" (see here), was paralleled in Hebrew, where the root tet-bet-ayin came to produce the word for physical phenomena, his explanation of each of these terms as meaning "the characteristic of" is fanciful. And the American Hebrew responds as such, claiming that he misunderstood Asher's use of the word. In the meantime, another rabbi responded and pointed out that there is a Hebrew word for nature - but that was hardly in dispute, as Asher was certainly aware of the medieval coinage (pun intended). 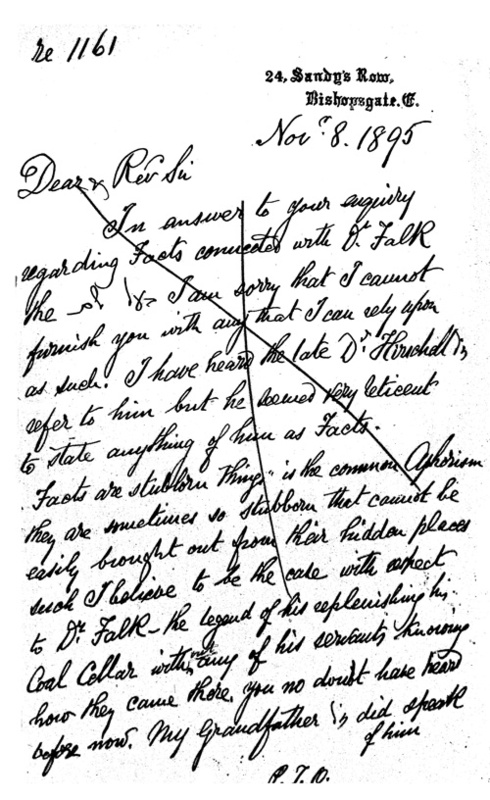 However, the American Hebrew appends a note explaining that it received another letter from Rodkinson, where he denies that he misunderstood Asher. See for yourself - I think he did misunderstand Asher, and his explanation is weak, but you may disagree. It appears to me that while his level of English - at least as of 1901 - wasn't quite as bad as people made it seem, he certainly was not fluent. What we see here, is that he did not grasp the multiple meanings of the word "nature." While he was aware that "nature" means the character of something, he mistook its meaning in article about the use of the term in the sense of the physical world. Something about history which fascinates me is - time. The passage of time. And for this, reminiscences are important. There are many people who can tell you things about people and events which too place 80 years ago, and certainly 50 years ago (hopefully some of them are reading!). Talk to them, ask them. And then, you should live long, tell people yourself what you heard in 30 or 60 years from now - and just like that: someone gets to hear something close to a firsthand account that is almost one and a half centuries old. It may be 2013, but there are people who can still tell you all about people they knew who were born before Lincoln was elected president. Related to this: to me, in some ways, the 1870s don't seem that long ago. But the 1810s? Well, that's already getting remote. 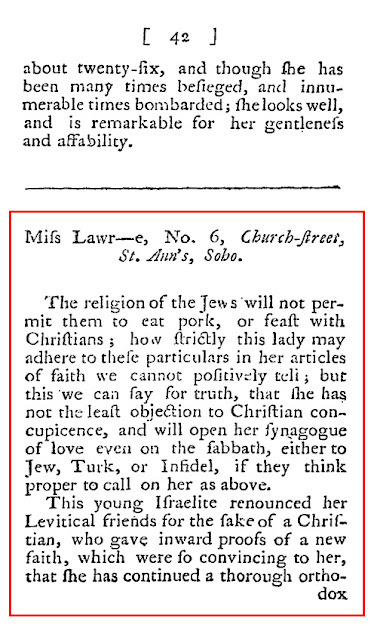 So I really enjoy reading things like the following, a reminiscence of Rabbi Solomon Hirschell (d. 1842), Chief Rabbi in London, which was published in the Jewish Messenger in 1873. True, much of it is about how Hirschell kind of had a lousy singing voice, but the descriptions of his preparations for leading the Ne'ilah prayer, the coaching by two singers, his booming and intense Shema, are fascinating. 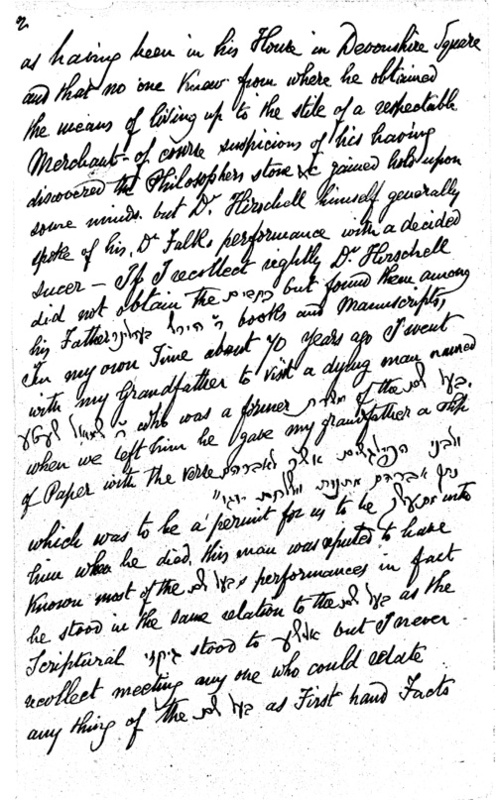 Also the anecdotes about how he barred the use of musical notes and a tuning fork - it had to be explained to him what a tuning fork was - and how one particularly zealous worshiper (a man of note) tattled to him, to say that the Chazan has used a piece from the opera Don Juan in singing Kaddish - and the attempts to explain to Hirschell what the opera Don Juan was, and that Don Juan was not a person who did not belong in shul - all interesting. "The synagogue is not an opera house," Hirschell concluded, not really caring in the end if Don Juan was a person or an opera. "In those [days]... those who held rabbinical offices. This may have arisen from the circumstances that then there was but little spiritual sickness in Israel, hence they wanted no Doctors, while now sluggishness and indifference have caused so much mental disease, as to require doctoring. Hence, I suppose, it occurs that the Rabbi has been superceded by the doctor." I'm not precisely sure when "those days" were - but one imagines it could have been the 1810s, or perhaps early 1820s. Thank you, Gabriel, for a fascinating post! - S.
By way of background: Although the books of Scripture were written this way in ancient times (Qumran Scrolls, anybody? ), and in Talmudic times (see Bava Bathra 13b ff. ), the practice disappeared in later times, with the adoption of the codex, a form of book that is more convenient with regard to searching. (The one famous exception, of course, is the Book of Esther.) We have a fragment of a scroll of Melakhim from the 8th or 9th century, and then nothing, until Early Modern posqim start to express their anxieties about the fact that we're Doin' Things Wrong. In following years, the idea spread among various Litvaks, both in Lithuania and, later on, in Palestine. However, most of these Litvaks were interesting only in writing the 5 megilloth, for public reading in synagogue on the various holidays, and the Nevi'im, for use in public reading of the Haftaroth. Nonetheless, there were some exceedingly inspired individuals who wrote out scrolls of the not-usually-liturgical books of Nakh. This is mentioned in writings by R' Shemuel Shelomo Boyarski (link), who writes about the scrolls that he himself has written, and Akiva Yosef Schlesinger (link), who writes about the scrolls written by a certain Barukh Shelomo. Moreover, I have held in my hands a scroll of Iyyov, written in 19th-century Lithuania or (most probably) Palestine, and a scroll of Divre Ha-yamim was sold at Kedem Auction House a few years ago (link). (It was sold for only $2000. If I had known at the time, I would have bid more than that. And now it's in private hands, and I can't even see it or access it. Grrr.) Moreover, Yossi Ofer has blogged about a scroll of Mishle that was found in the National Library of Israel earlier this year (link). He writes that this scroll was probably the very one written by Boyarski, because he knows of nobody else who was writing scrolls of Kethuvim (besides megilloth) at the time -- but in fact, the phenomenon was more widespread than just Boyarski. Mezuze-cases: Made of olive-wood. Closed or open, round or rectangular. Especially interesting is that you can order Nakh scrolls in Vellish, i.e. Sephardic script! (The word "vell[i]sh" is a somewhat dismissive expression to refer to Sephardim, or speakers of Romance languages in general.) What Sephardim are ordering Nakh scrolls? (Weird Jerusalem ones, presumably.) Or, alternatively, what Ashkenazim in Jerusalem are using Vellish? The current Vellish script is more-or-less identical to the old medieval Ashkenazic script, but what Ashkenazim were still writing in it in the 19th century? Bohemian ones, apparently, but were there a lot of them in Jerusalem, and would they have been interested in the nouveau Litvishe shtick of writing Nakh-scrolls? Anyway, "Vellish" script is much easier to write than current Ashkenazic script, and therefore is significantly cheaper, as anyone who has shopped around for tefillin knows. Perhaps this is why a Litvak might want to order Nakh scrolls in Vellishe script? This post deals only with the material culture aspect of the scrolls of Nakh, and does not deal with the halakhic or philosophical rationales behind why someone might want to produce them. Also, it does not deal with the question of how these scrolls might have been used, in ritual or non-ritual contexts. As such, it only scratches the surface of the issue, and there remains a whole book to be written about the topic. If any readers of this post know any information about any scrolls of Kethuvim (besides the megilloth) from the 18th, 19th, or 20th centuries, information that is not covered in this post, we will be delighted to hear from you in the comments, whether here or on Facebook. Here is the ad, as it appeared in the original publication; Moria, November 20, 1912. 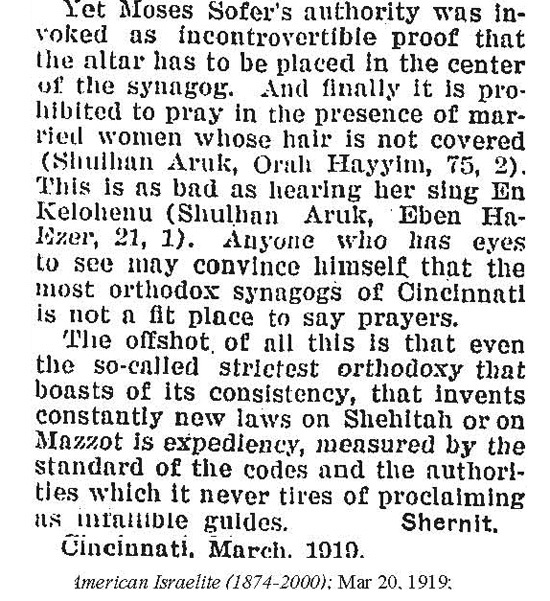 From the American Israelite March 29, 1929. Note the very interesting remark that at times the Hildesheimer Seminary relied on support from Russian Jews, even though German Jews certainly could have sustained all its economic needs. Also, the author of this appeal, frames the support for the yeshiva as a debt which American Jews owe to it, having received much spiritual sustenance from the alumni of the European yeshivas. This is excerpted from Mrs. Julian Nathan's two-part article "A Woman's Impressions of Palestine," which appeared in the American Hebrew on Dec. 15 and 22, 1922. This being 1922, unfortunately Mrs. Julian Nathan's own first name is not supplied. The Miss Landau to which she refers is Annie Edith Landau. She describes her meeting with Rabbi Chaim Leib Auerbach, R. Shlomo Zalman's father. Since she refers to her "father's book "Tub Taam," I assume she was R. Aharon Zvi Friedman's daughter, although I suppose there may be other works by that name and thus other possible candidates. Note that she says that Rabbi Auerbach predicted that in 80 years the exile would be over. And read the rest. 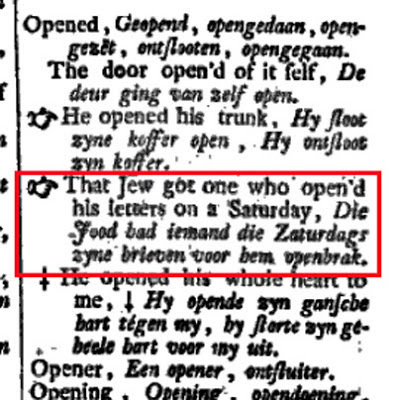 Here's part of a great exchange in the pages of the American Hebrew in 1899, notably because one protagonist was a young Israel Davidson, and the other's rejoinder included a pretty amusing Hebrew translation of Yankee Doodle. What had happened was, Jacob Goldstein (1855-19? 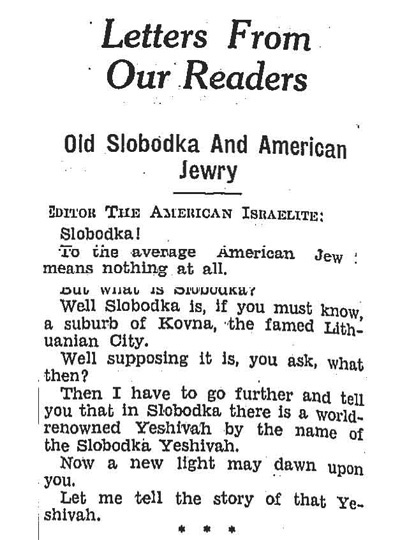 well, he was alive and a chaplain in the US army in 1918), an English-born, Australia-raised rabbi in Newark, and also a one-time editor of the American Hebrew, had written a review of Menachem Mendel Dolitsky's book of Hebrew verse Kol Shirei Menachem.... In the review, Goldstein made several unpardonable sins. For example, he had not read each and every poem carefully, and treated one, a piyyut for Yom Kippur, that was actually satire, as if it were the real thing. 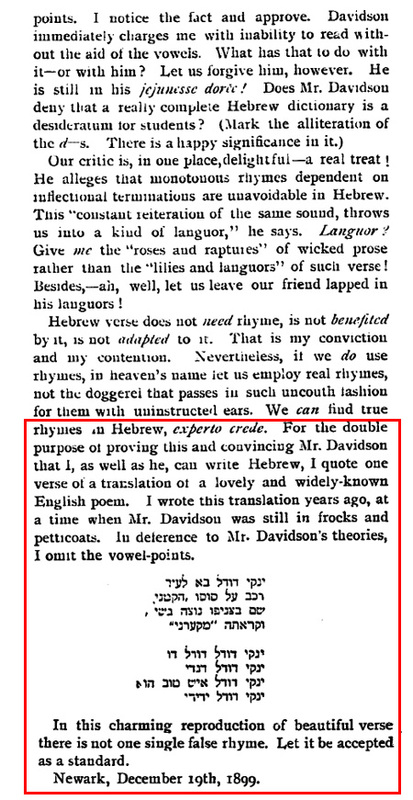 Secondly, he wrote something about rhymes in Hebrew that Davidson considered to be an error. Thirdly, he approved of the poems being published with nikkud, making it useful to a student of Hebrew who, with the aid of a dictionary, will be able to enjoy the book. Here Davidson takes a really low blow and says that Goldstein personally needs the vowel points and a dictionary, i.e., he is a novice in Hebrew! 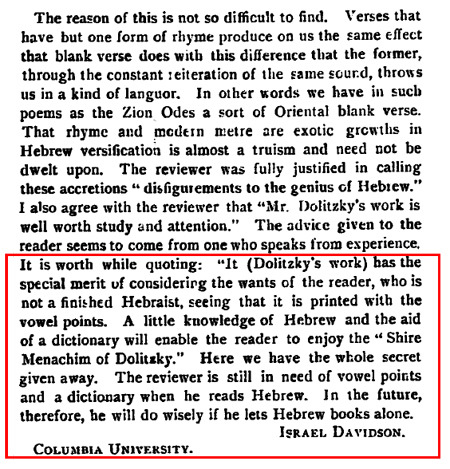 Davidson is merely reiterating a sarcastic point he made early in the letter, claiming that "Hebrew is the most difficult language to acquire at a mature age, [so] if a man, old enough to write such a facile English as the reviewer does, begins to study Hebrew and in a short time presume to judge of the character of a Hebrew poem from the title [Piyyut Le-yom Ha-kippurim], he must indeed be a phenomenal being. Nay, it occurs to me just now, that we should regard one with awe, who attempted to divine the meaning of any kind of poem without first reading it." As you can see, he also criticized Goldstein's English - something that seems to have been something of a past-time among the scholarly immigrant crowd in those days. By the end - it seems to have passed sarcasm, and Davidson seems to believe that Goldstein doesn't know what he is talking about. Israel Davidson, of course, knew a thing or two about Hebrew poetry, going on to compile the magnificent and still amazing Thesaurus of Hebrew Poetry/ Otzar Ha-shirah ve-ha-Piyyut. But he was young, and got carried away with sarcasm. Goldstein rejoindered that Davidson is correct that he is guilty of not reading the book carefully, as far as that goes, although he said so in the review itself, that he was asked to write a "notice" not a review, of the book. But he takes serious issue with the other criticisms, correctly taking him to task for his nasty (and ungrounded) assertion that he is a Hebrew beginner. Finally, his response to Davidson's critique about rhymes is to print a few lines of his poem Yanki Dudel Ba Le-ir. He was born to a distinguished Hasidic family; his father was Sender (Alexander) Frumkin (1799-1876) of Shklov, his mother, Radka Hayyah Horowitz (1802-47). 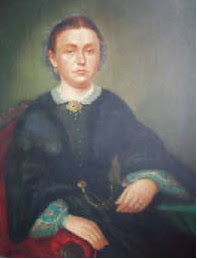 Radka died when Rodkinson was an infant, and he later changed his surname from Frumkin to Rodkinson, that is, Radka’s son. "...my father's name was Alexander Frumesch (see Toldath Besht, p. XXXVI), after his father, that grand man, Nacheur [sic?] Frumesch, and only his sons adopted the name Frumkin, for they were so called by the people. My name Rodkinson, after my mother, Rodke, who died one year after my birth, was given to me in childhood to save me from military duty, as was also done to my brother, Leib Hirsch, who lives in Jerusalem. In spite of this, being in Russia, we used to sign in private our renowned family name, "Frumkin." I, however, used to add my mother's name in private letters as well as in my publications, which can be proven by my books, published previously to 1876, when I emigrated to Konigsberg, Prussia." In the aforementioned "Toldath" he writes his grandfather's name as follows: מנחם נחום פרומעש משקלאוו. And he also gives his mother's name as: ראדא חאסיא. 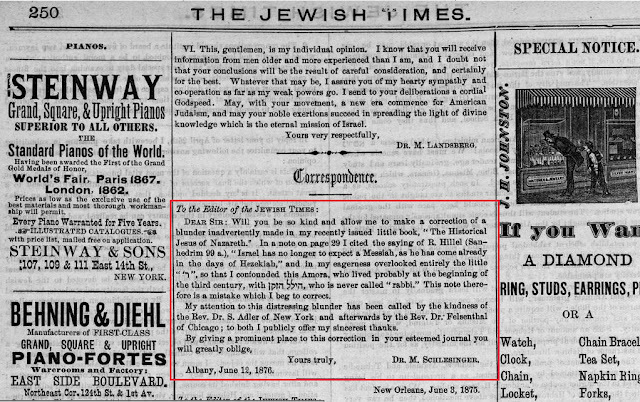 Here's a fascinating editorial note in the Nov 27, 1903 issue of the American Hebrew. 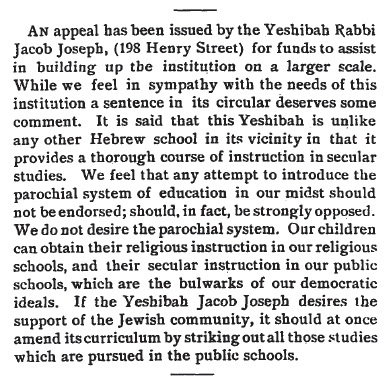 As you can see, it opposes one element of the appeal for funds for a larger building needed by the Rabbi Jacob Joseph Yeshiva, then very new: that the yeshiva provides secular education under the same roof as its religious education. This is in effect the very critique most often leveled from the right at the Torah U-madda idea of Yeshiva University, albeit here the argument is very different - it desires the secular education to take place in public schools as anything less is incompatible with democractic ideals. 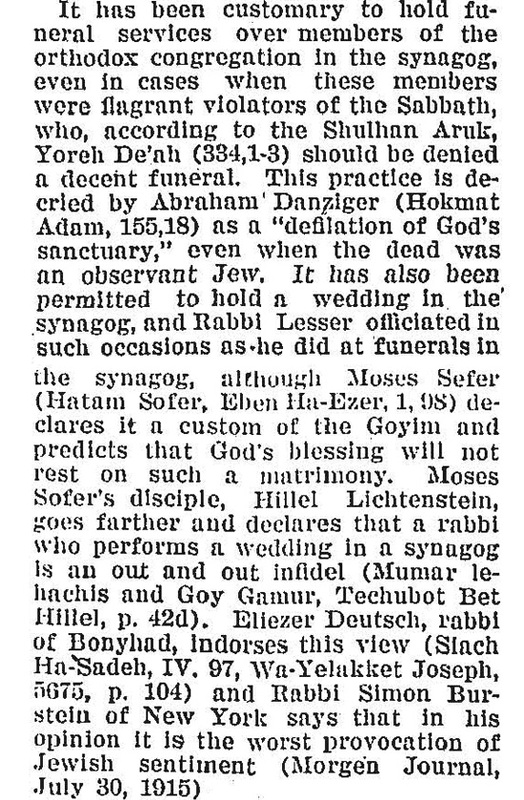 Here's an interesting part of Gotthard Deutsch's obituary for David Rosin in the American Hebrew (Jan. 22, 1895). 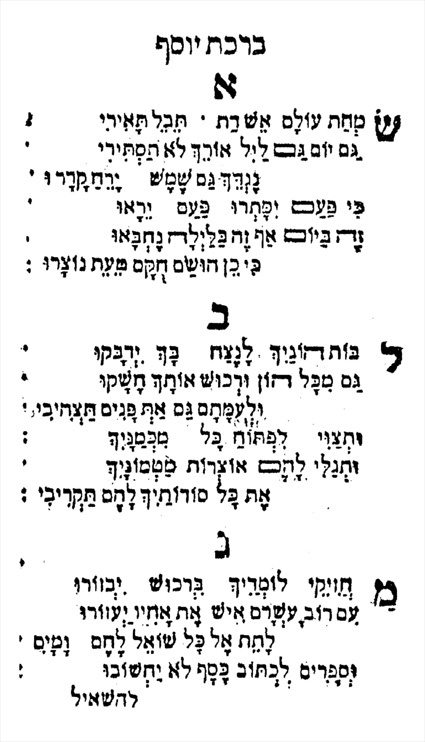 Rosin taught in the Breslau Rabbinical Seminary established by Zechariah Frankel, and is best known for his edition of the Rashbam's commentary to the Torah. To give some context to the Deutsch's remarks below, in the same article Deutsch cites an alleged quote by Samson Raphael Hirsch, that the Right and Left sides of the street are for men, the middle of the road is for horses. As you can see, Deutsch, an American Reform rabbi, had maintained that it was impossible to "restore the old Jewish piety with its ideal of conforming to the law" - halacha. Not that Deutsch wanted to, mind you. Rosin, however, strenuously objected that this was "a policy of despair" and that individuals could be brought to strict observant, even if this could not work on a communal level. "Our women will not submit to the "Sheitel:" our men will not banish ghosts by Cabbala: our boys and girls will read novels in spite of Joseph Caro, etc." And he continued to say that across the spectrum, what needed to be fought was indifference. Since we are talking about religious Jewish life in America at the turn of the 20th century, it would be interesting to produce a page from a book that was first called attention to the world by Mendel Silber in his 1916 article "America in Hebrew Literature." 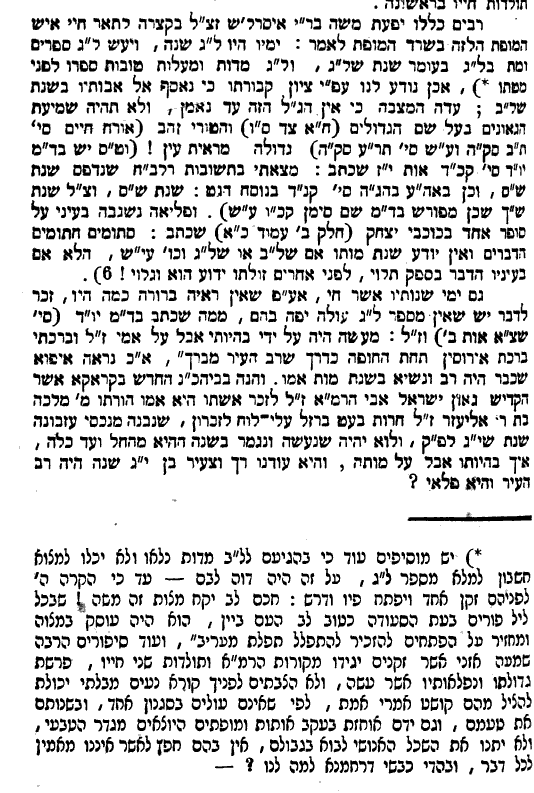 The book, published by R. Chaim Shlomo Silbermann in Jerusalem (1899; not 1859 as per Silber) is called Or Yaakov, and the bulk consists of various unpublished commentaries by the Vilna Gaon, for example, there is a piece explaining the aggadot of Rabbah bar bar Hannah. 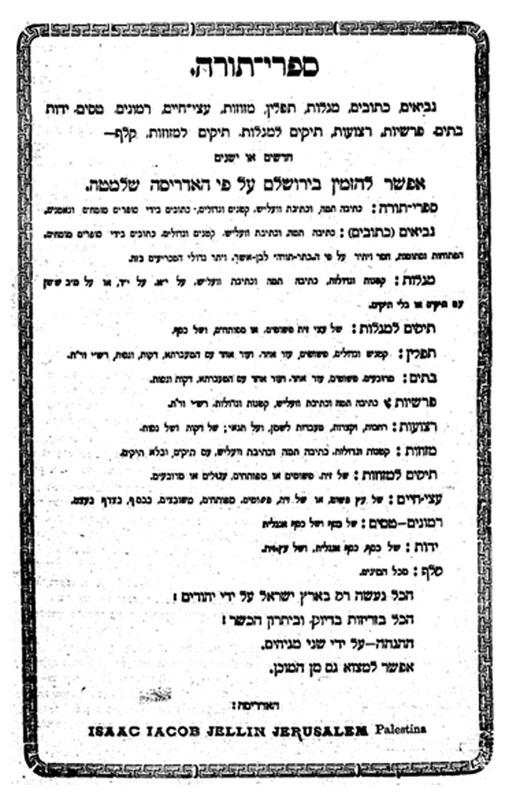 Appended to the end are two pages of a bar mitzvah derasha given by Silbermann's nephew, Yitzhak. The reason why this was important, says Silbermann, is that the boy, whom he is exceedingly proud of, grew up in Hazleton, Pennsylvania. When he received the text of the derashah it was to him like the day the Torah was given at Sinai. This boy is a "tzaddik ben tzaddik" - the boy's father was an alumnus of Volozhin; a student of R. Hirsch Leib (=the Neziv) - Silbermann gives two examples of the lad's boyish piety: he answered "amen" at age 4, and would not eat without making a berachah at age 7 or 8. 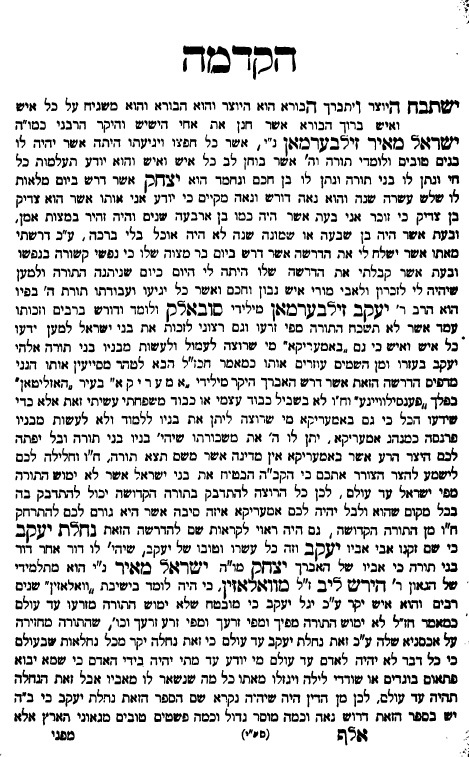 And there is the derashah itself, which shows that it is possible to raise a ben Torah in America. Most interesting is his dichotomy between raising a child to learn Torah and teaching a child parnassah ke-minhag America. * The reason I wrote "so to speak" about these rabbis is because, technically, only Gotthard Deutsch was a practicing rabbi. The others were scholars, one affiliated with an institution (the Breslau Seminary) and the other, apparently, an independent talmid chochom. However, for the purpose of that snappy, snappy title - these were all three learned Jews, each with a vision about the apathy and unlearnedness of Jews of their time, and the potential for restoration. This fascinating article is from the NY Herald, 1893. It must be noted - since not everyone reads to the end - that on protest by the British, the Grand Vizier reversed the order. 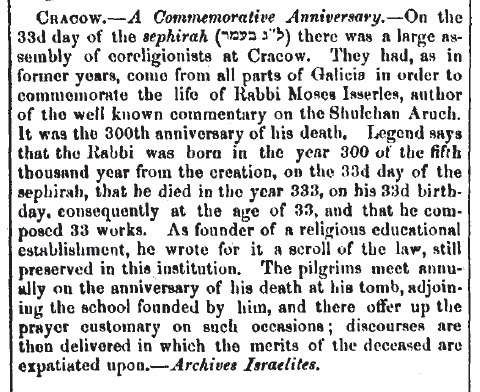 Who was the 6' 3" tall, 103 year-old, clear-sighted, ascetic rabbi in Dublin in 1771? From Hoey's Dublin Mercury Dec 5, 1771. May is about the time of year when I started On the Main Line. I don't know the exact date, because the April before is when I started blogging someplace else. And when I switched, I moved some of the old posts, recopied them. So either May 9 or 10 is the day I started On the Main Line. A pretty long time ago in the blogging world. To see an infant with eyes fused shut, soft and pink and squishy, covered in down and adorable turn into an immature, bright 8-year old! I love it. Thanks, if anyone is reading. I suppose I should reflect once a year. I'm not sure what to say. A lot of good things came about for me because of blogging. I got to know so many of you via email, and also in person, and made some dear friends. I have had my eyes and mind opened in so many ways. I learned a lot. Discovered some interesting research methods. You know, independently inventing the Digital Humanities. Kidding, a little. I want to thank everyone, the hundreds of people who read every day, on every continent (except the proverbial Antarctica, at least so far). It's especially gratifying to me when I can see a referrer and that a person was looking at one of my posts through Google Translate. I'd like to thank the people who find the blog using funny keywords, the people who ask questions with some kind of confidence that I know or could find the answer. I have learned so much from readers, anonymous commenters, emailers - some of you don't realize how intimidating your depth and breadth of knowledge is! I'm sorry about the drowning in email problem, and my resolution for the next 8 years is to try to become better with that. In my defense, generally I want to give queries the attention it deserves and sometimes I get overwhelmed. I will try better. I also want to thank each and every one of you who came to help when I was drowning in financial woes. I am sometimes shy, but I want to tell you very clearly: you helped me and my family survive at times. Literally. And I will never, ever forget that. I also want to thank those of you who keep pointing out when I did a post with a Part I, and never got around to doing a Part II. The explanation is that when I post like that, I'm trying to set a goal for myself, trying to make a placeholder. Sometimes the Part II happens, sometimes not. Part IIs may always end up happening, even it takes a long time! I also want to thank readers who have never failed to inform me when I am quoted, cited or - yup, ripped off - in various periodicals or blogs, in which I may never have realized. I want to reflect a little on why I blog, and why I pushed myself through funks, moments completely lacking in inspiration, and times where my interests shifted from the topics I blog about. The reason is quite simple: so I could sit here today and write this! Most blogs are short-lived, even the ones that burn bright for a time. Blogging itself may be, or supposedly is, dead. And I know that I have to adapt. My vast numbers of comments dried up years ago, even as each year my daily hits increase. So look for some changes, at least aesthetic changes, to come - hopefully soon. I have plans, publications, etc. We'll see what happens. In the meantime, I am glad I persevered. To give myself a pat on the back, I learned that I have good instincts for what others' find intriguing: it's what I find intriguing! And there are all sorts of little crumbs, some just bits of gold dust, others well-known gems, and still others rare, unknown gems which are scattered all over our vast literature, the treasures of the Jewish people. So it's been very gratifying to discover some of them, and popularize them and bring them to light. - there is no end to such treasures. - truth is as strange as fiction. And I almost forgot! Thanks to all the libraries and companies that digitize books and journals in free and other kinds of databases. I of course especially mean Google and Hebrewbooks.org, but there are many, many others. Growing up, I never dreamed that I would have a library with easily tens of thousands of books and/or sforim, each one highly interesting to me. And now I do. Millions actually, only some more or less interesting. I also want to thank two individuals who helped me gain access to - well, I don't know if I can talk about it openly - but their confidence in me enabled an endless flow for me, to be able to access resources which I need and which I was only able access before their help, in inconvenient ways. We may not have communicated about it for a long time - but thank you. ETA: (I wish I had remembered that I planned to include this!) I have to give thanks and public recognition to three individuals. Two of them have helped me personally, and inspired me in different ways, and one died more than a century before I was born. I mean to thank (in age order) Shadal himself, a great man whose example taught me much about intellectual honesty (striving for) and most importantly, the importance of helping others' in their scholarship. Secondly, Professor Shnayer Leiman, who while he could not teach one to be a genius, taught me something about humility, something about critical thinking, and something about checking sources, always. In addition, he has personally helped me in a very significant way. Thirdly, Prof. Marc Shapiro, who in addition to helping me more than one time in a significant way, has been a very good friend. Oh, and Google AdSense, please explain to me how exactly I violate copyright and why you don't let me place ads on the blog? Thank you. Your automated reply won't tell me a thing. Well, keep reading. I'd like to think that as long as there is someone to read, I will keep researching and posting. Thank you, and enjoy! 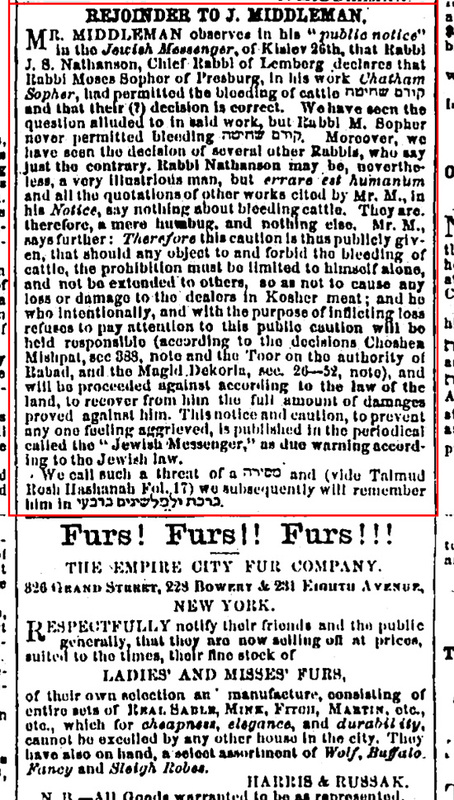 Here are a pair of ads from The Jewish Messenger in 1861, concerning a famous episode in the history of kashrut in America, that arose in the 1850s. As you can see, the first ad is a public notice that anyone casting doubt on the kashrut of calves slaughtered after having been bled (see below) has only the right to be machmir on himself, but great authorities permit it. Anyone violating this is causing a loss to butchers, is liable according to the Shulchan Aruch - and the law of the land (they can be sued). It is signed J. Middleman. 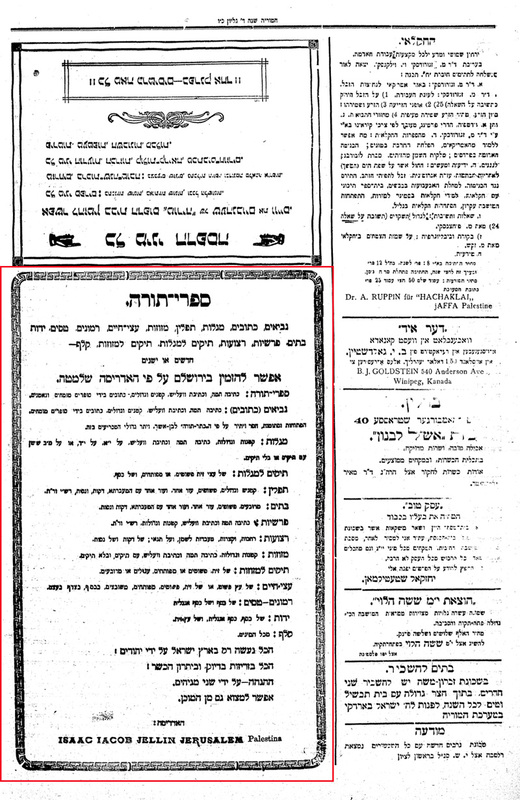 Below it is an unsigned ad stating that Middleman is wrong about the view of the Chasam Sofer, and so is R. Yosef Shaul Nathansohn, if that's what he said: ""Rabbi Nathanson may be, nevertheless, a very illustrious man, but errare est humanum..." It continues to say that it considers the threat of recourse to the laws of the United States in preventing him from speaking out is - mesirah, and furthermore Middleman shall be remembered in the blessing Velamalshinim. The issue concerned the lovely practice of bleeding cattle, which amounted to draining them of most of the blood in their body from the jugular - while alive - before slaughter. Descriptions of the process are horrible. The better to have whiter veal. Cruelty aside, naturally, the question was whether the practice renders the animal trefa. 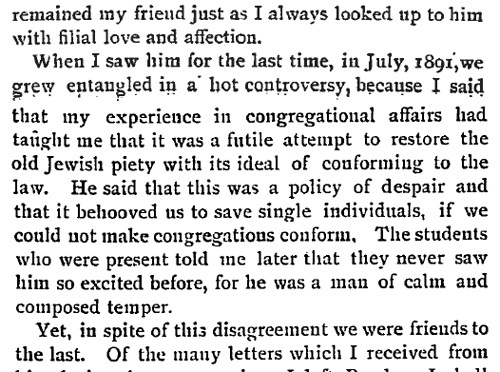 A shochet of pious reputation named Aaron Tzvi Friedman (1822-76), newly arrived in America, discovered that this was a regular procedure here, and was shocked. So he asked R. Judah Middleman in New York ("Yudel"; an interesting figure who, among other things, wrote a reply to Alexander M'Caul's infamous missionary tract Netivot Olam-Old Paths; Mittleman's book was called Netivot Emet-True Paths, and was translated into English in the 1840s). 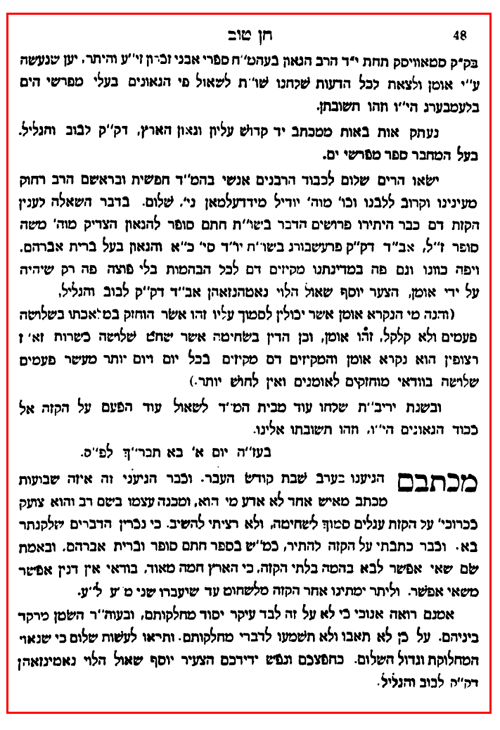 Mittleman was originally from Lemberg, and he asked a friend of his, perhaps Galicia's greatest posek, R. Joseph Saul Nathansohn, who replied that it is permissible, and the Chasam Sofer already permitted it, but it can only be done by an expert, so it doesn't render the animal trefa. 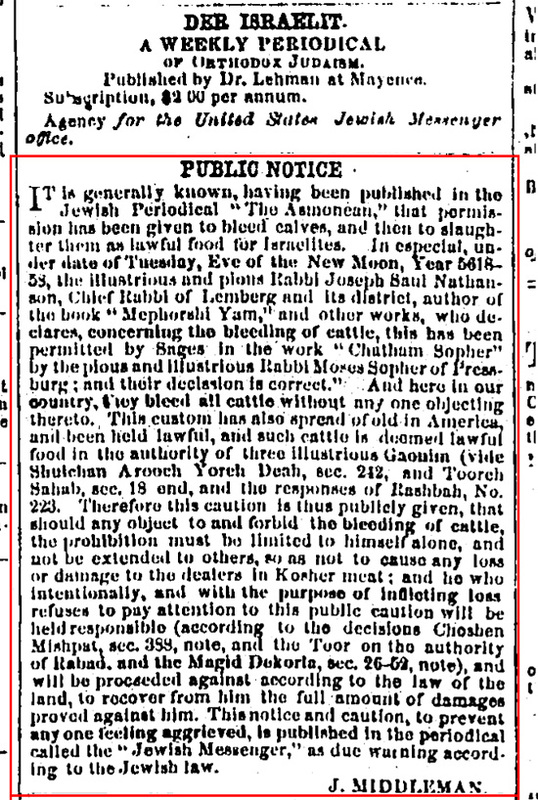 I admit here that I didn't do my homework yet (=look in the primary sources), but according to others who have, the Chasam Sofer only permitted bleeding cattle for the health of the animal itself, not indiscriminately. 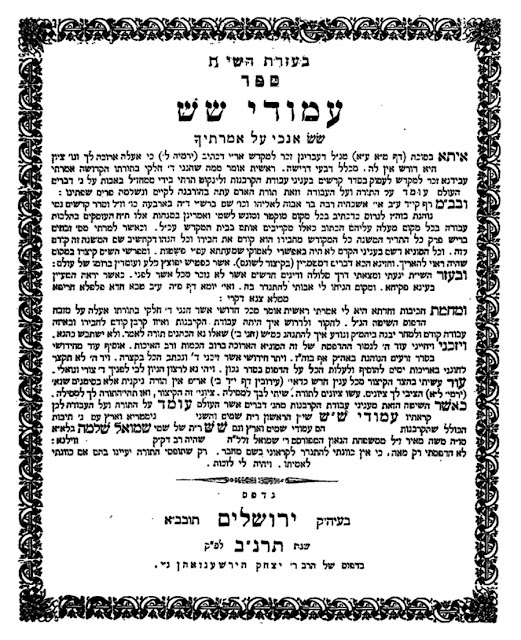 The above work was part of a series of pamphlets on shechita author by Friedman, best known as Tuv Ta'am, the first part of which was translated to English, written as and used as a defense of shechita from attack (English, here). Here is, incidentally, a wonderful blog by a descendant of R. A. Z. Friedman, the shochet in this story, who posted many facts about his ancestor, as well as these two wonderful portraits kept in the family, of Friedman and his second wife (link). Apropos, there are a number of responsa from R. Nathanson to R. Middleman, including one interesting one regarding whether or not a church can be converted into a synagogue. For those interested in seeing an English name of a Church explained in a teshuva, here it is, "Written in English 'Welsh-Scottish Methodist Church.' This means, of those from Wales, joined with people of Scots Land, Lutheran church." Then he describes their service, and the beliefs of Protestants generally. See Otzar Yisrael Vol. 2 pg. 246, entry on R. Avraham Yoseph Asch (link). 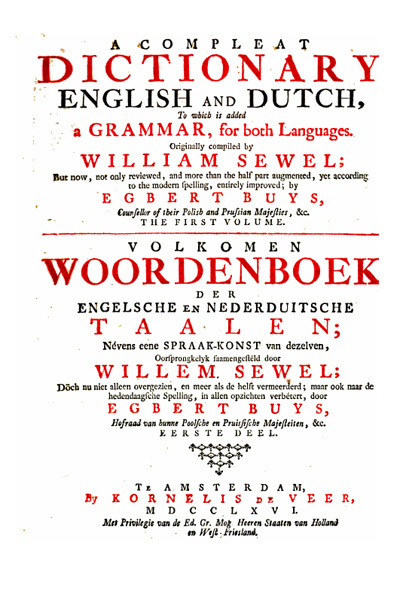 Here's a fine entry in Sewel's Compleat dictionary English and Dutch (Amsterdam 1766 ed.). 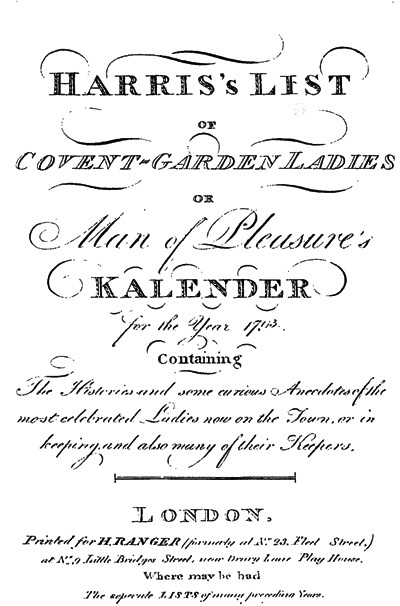 This account of a Jewish prostitute in London is from the 1793 edition Harris's List of Covent-Garden Ladies: Or, Man of Pleasure's Kalendar, the notorious guidebook giving addresses and reviews of the London, err, nightlife. R. Moshe Issserles. 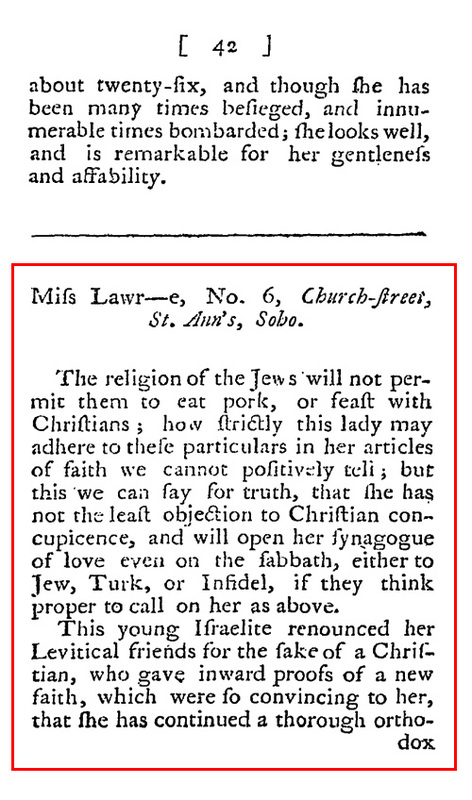 From The Jewish Messenger, Sep. 8, 1865.
c.f. this footnote in Lev Ha-ivri (Ungvar 1864) by R. Akiva Joseph Schlessinjer. Here's my almost-but-not-quite-perfect transcription of a letter to Hermann Adler, Chief Rabbi of Great Britain concerning the Baal Shem of London. Adler wrote a fascinating paper on Chaim Shemuel Yaakov Falk, the aforementioned Baal Shem (of Dr. Falk, as he was known). Evidently this letter was part of his research - fully 8 years before he read the results of his research, which you can read here - consisting of various inquiries that he made of old timers and people with connections to those who did remember Jewish London in the 18th century. Unfortunately, I cannot make out the signature here, but I believe the man is surnamed either Myers or Alexander on the basis of some hopeful searches of his street address. 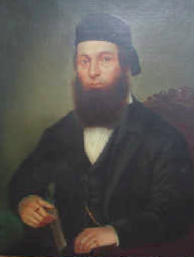 He refers to his grandfather, evidently a rabbi, active in the 1850s 1820s (see plausible correction in the comments). Alexander seems the likelier candidate, perhaps because a Rabbi Michael Myers (d. 1814) actually knew the Baal Shem, and while not all Myers would be related, one surmises that this writer would surely have mentioned the aforementioned Myers who knew the Baal Shem personally. And if I am wrong, and if I've made mistakes in the transcription - please let me know. ETA: I would like to thank Simon, Marc Kirschbaum, and David Wolfson for their helpful corrections and suggestions. Go crowdsourcing! In answer to your enquiry regarding facts connected with Dr. Falk the בעל שם I am sorry that I cannot furnish you with any that I can rely upon as such. I have heard the late Dr. Hirschell ז'ל refer to him but he seemed very reticent to state anything of him as facts. as having been in his house in Devonshire Square and that no one knew from where he obtained the means up living up to the stile of a respectable Merchant - of course suspicions of his having discovered the Philosopher's Stone &c. gained hold upon some minds, but Dr. Hirschell himself generally spoke of his, Dr. Falk's performance with a decided sneer - If I recollect rightly Dr. Hirschell did not obtain the כתבים but found them among his father ר' הירש בערלינרs books and manuscripts. In my own time about 40 years ago I went with my grandfather to visit a dying man named ר' שמואל שעטע who was a former משרת of the בעל שם When we left him he gave my grandfather a slip of paper with the verse ולבני הפילגשים אשר לאברהם נתן אברהם מתנת וישלחם וגו which was a permit for us to be מתעשק ? unto him when he died. This man was reputed to have known most of the בעל שםs performances. In fact he stood in the same station to the בעל שם as the Scriptural גיחזי stood to אלישע but I never recollect meeting any one who could state any thing of the בעל שם as First hand Facts. I am sorry that I cannot furnish you with anything more tangible on the subject but I think that the majority of his reputed miracles are like the Epitaph on his מצבה neither legible nor plausible. Couple of notes. It's interesting how Falk's writings wound up in possession of Chief Rabbi Solomon Hirschell - through his father, no less. 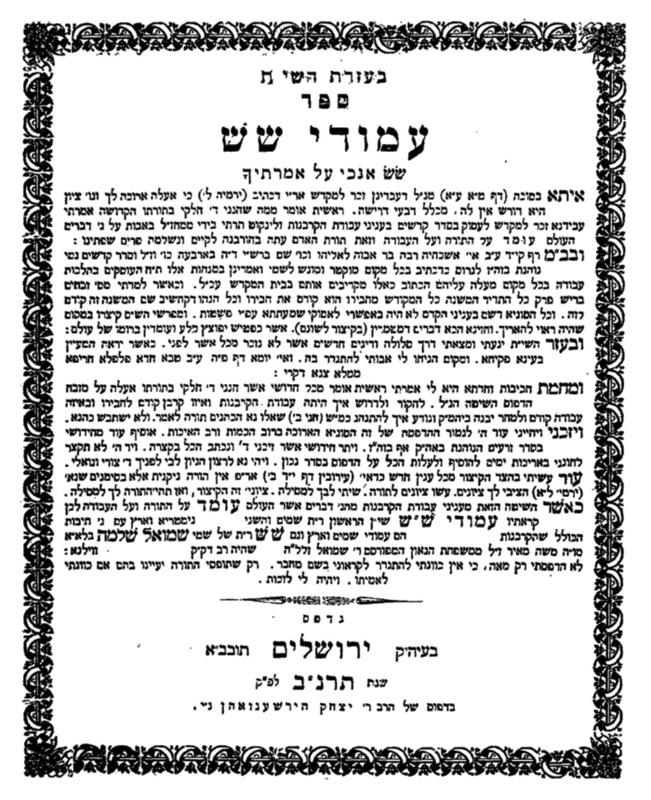 This rabbinic family was closely related to R. Jacob Emden, who condemned Falk as a Sabbatian (see here). It is hardly surprising, yet interesting, to see Hirschell remembered referring to Falk with "a decided sneer." Secondly, it is also interesting that the writer names a servant of Falk, R' Shmuel Schotte (? 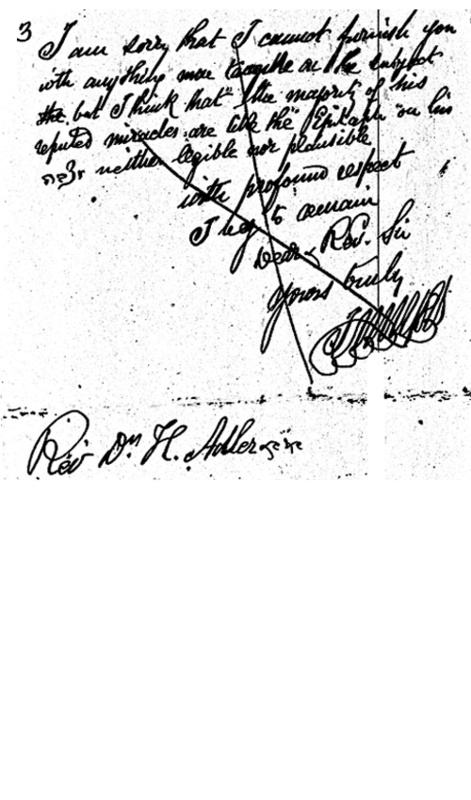 ), whom he says died about 1855. Falk died in 1782! So an old man this Shmuel Schotte must have been - and to be compared to Gehazi no less! If anyone can make heads or tails out of the strange amulet this Schotte gave the writer's grandfather, please do tell. The source for this letter is here. "Amendment one of the Constitution of the United States guarantees to every citizen full freedom to decide whether En Kelohenu shall be babbled off or sung." 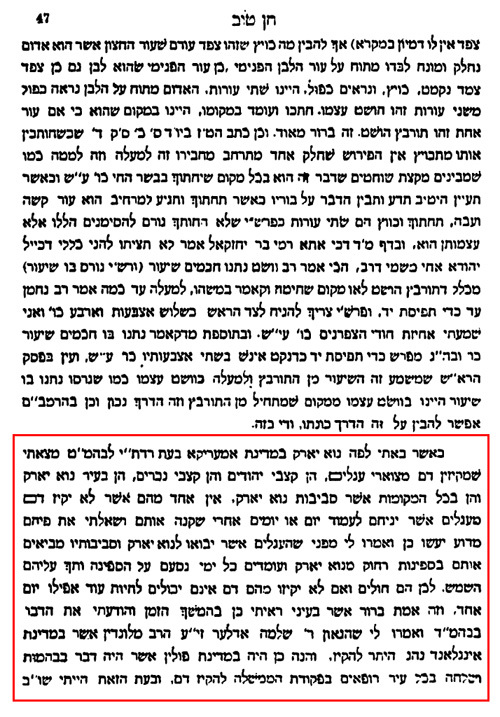 So allows the writer in the American Israelite, even as he critiques the decision against singing En Kelohenu by Rabbi Avraham Gershon Lesser (1834-1924) an American Orthodox rabbi in Cincinnati, president of the Agudas Harabbonim, and active Mizrachi leader. Attacking Orthodoxy for inconsistency in fealty to halacha was a typical and constant Reform polemic against Orthodox Judaism. Sometimes the argument would be, our people profane the Sabbath, and so do the Orthodox laymen - but only the Orthodox laymen are opposed to omitting a piyut. This was a charge constantly leveled at the types of modern or Neo-Orthodoxy which did make some compromises against the strictest possible approaches, while remaining strict about other things (e.g., head-covering). Interestingly, here the attack is on this stringency - not to sing En Kelohenu because it may lead to... English - because in other cases, this same rabbi was lenient or permitted or ignored things blatantly against halacha. In this case, the argument is that the same synagogue presided over by a rabbi who decided against singing En Kelohenu hosts mixed dances. He goes on to expose other inconsistencies, where Rabbi Lesser had permitted mild Reforms of the type vehemently opposed by authorities like the Chasam Sofer. 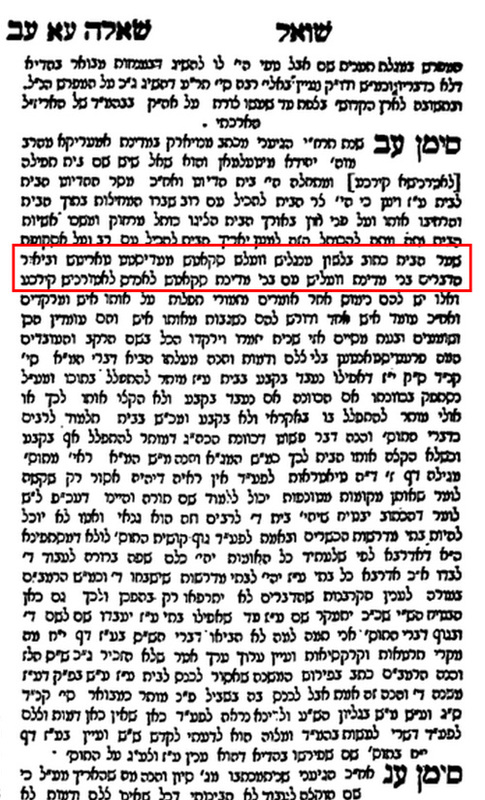 And as you can see, by the sources he quotes, this particular writer was keeping very much abreast of current rabbinic scholarship, quoting rabbinic journals of the time, such as Veyelaket Yoseph of Bonyhad, Hungary where current rabbinic scholarship was constantly published. Finally, he closes by claiming that "even the so-called strictest orthodoxy that boasts of its consistency, that invents constantly new laws on Shehitah or on Mazzot is expediency, measured by the standards of the codes and the authorities which it never tires of proclaiming as infallible guides."